Showing results for tags 'khχ'. Should I watch KHχ[chi] now? As the topic states, should I watch KH χ[chi] now (as in youtube clips)? I've been wanting to wait to experience the end of KHχ in KHUχ but it seems the latter is seriously diverging. From what I can gather, the recent stuff involving the new Dandelion leaders is new content as well as the player character having fun with friends. It seems after the battle with Aced, in KHχ the keyblade war starts but in KHUχ, never happens. Or is it just that KHUχ is doing some "filler" at the moment? Basically, my question is will the Keyblade war seen in KHχ happen in KHUχ or should I go ahead now and watch the old browser game's conclusion? I don't mind if you use mild spoilers if you need to explain something. I know the gist of KHχ's ending. P-p-p-penultimate maintenance update So, we’re in the last month of Chi, and with it comes some great updates for those of you who are completionists. Without further ado, let’s start off with Chi’s integration with the Japanese UX. Some new features help players bridge the gap from one game to the other: · You will be able to bring your avatars, permanently, from Chi to UX. This service will be implemented once Chi ends. Some avatars may not transfer. · You are able to exchange Ultimate cards for special coins that can be redeemed on “Limited Medal Boards” in UX. Ultimized Key Arts (and other “special” cards, full list here in Japanese) will grant you 6 coins whereas regular cards will grant you one coin. Please note that the stats of the cards do NOT need to be MAX, so if you have some un-ULT’ed Key Arts lying around from Mog Shop or Raise Draw, Ult them and then transfer them for easy coins. We have a new event going on! Dwarf Woodlands, Wonderland, Agrabah, and Olympus have been infested with the Shadow-type heartless! Beat them all to get exclusive avatar parts and the new FGM SP SR+! Additionally, completing missions will get you the “Rainbow Ticket” which will allow you draws on the Avatar Draw, in which you can get most every costume piece that you may have missed, including premium player only outfits! Using Mog Medals will allow you to get the general ones and using the Rainbow Tickets will allow you to get the premium player ones. Depending on how many avatar pieces you may have missed, this could either be a few draws or a ton of them. Prices are 50/30/10 for the Mog Medal trade and 3/2/1 for the Rainbow Ticket trade (set/hairstyle/accessory). Once you have gotten an item, you can no longer have a chance to draw it, so try your best to get all of the avatar parts you can! Full list of the event heartless: *note that the Gigas Shadows and the level 999 shadows will not be available until after the weekly update on 8/11 at 1300 JST. And for your guilt targets (7 pages long!!) Note that the Guilt +2 campaign is in effect until the game terminates. *note that the Gigas Shadows and the level 999 shadows will not be available until after the weekly update on 8/11 at 1300 JST. You are now able to obtain older cards that you may have missed in the past. Depending on what kind of card you want, you’ll need to pay using different types of currency, which includes SR Medals, SR+ Medals, and Mog Points (nothing too useful anymore), so getting a high completion rate in your card album is 100% doable. Traded cards will go into your Present Box. Note that any cards that were released after the termination notice in April cannot be traded for. (rip 100% completion) There is a login bonus currently going on. Log in to get really cool cards, tickets, potions, and ethers. Additionally there is a one-time gift of 33 Rainbow tickets. Note in the cards that there is no sign of Axel or Xion, and these are (most likely) the last cards to come to Chi. BP and AP recovery times have decreased significantly. BP now recovers every 5 minutes (as opposed to every 15 minutes) and AP recovers every minute (as opposed to every 3 minutes). Finally, one last little tweak made during maintenance is that when fighting a Raid Boss or Subspecies, your damage will automatically be doubled. This means if your deck is already x4 boosted using FGM SP SR+s, your deck will be doing 8x damage (before skill activation and the like). As like months prior, all keyblades will get their bonus if you line up your cards correctly. The last story update (insert gushing eyes here) is coming out on the 18th of August. Have fun playing in our last month of Chi together! Bonus screenshot! August 10th edit: updated to include this week's updates (which were released a day early? ), including new event heartless spawns and guilt targets. Today marks the second anniversary of my main account. If you remember reading my one year anniversary report one year ago, you’ll know I commented on the state of affairs in the game and how it’s evolved and changed. While I’ll do some commenting on that front, I’ll also use this time to take a look ahead to the last few months of Chi. This is not a solo endeavor, however. I encourage those of you who have played Chi, regardless of your interest level or dedication, to share your thoughts and memories of the game. Feel free to express your opinions in whatever way you like – screenshot, words, fan art, or anything else. I had fun bringing this year’s edition together. The way this will be set up is that there will be 12 different screenshots (one for each month of the year, July 2015 through June 2016) in spoiler tabs with a brief thought or discussion following each. Because the section is so long (rip tl;drs) it is enclosed in a spoiler tab, so please click the spoiler tab below to start reading! July 2016 and onward! As you Chi players may know, the Third Anniversary is rapidly approaching us. For those of you who are new to Chi and may not know what this event is, think of it as the game’s birthday and everyone’s invited to celebrate. Normally we get good handouts, like special cards and cool costumes, but the developers have been especially hard at work this year to give us a great final celebration to celebrate the end of Chi with! What exactly they have in store for us will be unveiled after the 7/7 maintenance. Following that, we also have story updates for Daybreak Town in both July and August (and possibly a conclusion the last day of service, September 1st), so please do stay tuned for that! Hopefully you’ll have enough energy after the anniversary event is over to play through the story until the end. Finally, there will (most likely) be weekly or biweekly events going on until the service terminates. No need to stop playing after anniversary (although some may feel that way lol)! Depending on how things turn out, we may have some incentives to play other titles in the SE BRIDGE lineup, as there may be transfer goodies for you to put towards once Chi terminates. For my final part of this, I wanted to provide a comprehensive list of folks that I really wanted to thank for their service to the community of Chi, both here on KH13 and on other various sites. These people have not only helped my understanding and development of the game but have made it more enjoyable, provoking thoughts and entertaining questions that may not have answers until Chi’s final day of service. Before I get to individuals, I’d honestly just like to thank the Chi’s English community at large – chances are if you’re reading this, you are or have been a part of it. So thank you! The list will go chronologically-ish to the best of my ability and recollection of folks. I’m only human so bear with me if there are some bumps along the way. - THE_ECHO – The writer of the guide I used to set up my Yahoo! Japan account and to eventually make it to play Chi over two years ago. I don’t even think I’ve ever talked with you, good sir/madam, but thank you for making that guide. It’s one of the many resources I point people towards if they are interested in starting the game but can’t get past the Japanese to sign up for an account. - ShardOfTruth (I think that was who it was) – I was lurking in a chatroom while watching someone play Kingdom Hearts II and they were talking about Chi. I remember them talking about it and that finally got me to actually sign up for an account. And, as they say, the rest is history! - Friend of a friend – I began playing Chi but, see, there was this thing called Kanji and I didn’t know what quite to do. So I asked my friend (who knew a little bit of Japanese at the time) what a certain character meant and she sent it to a friend of a friend, and I got a reply back with a link to the English-translated mission list on KHI (turns out the Kanji was defeat lol). Thanks for handing me such a great resource! - PTのRAKIさん – 皆さんのPTのRAKIさん、ありがとうございます。私は初心者でした。今も初心者思います。でもね私がPTのRAKIさんに参加を感謝しています。だから、ありがとう。 - Kaoru – I don’t know what the likelihood of you seeing this is (considering you don’t really visit KH13 much anymore) but in all seriousness, dude, thank you for speaking English and for prompting me to make a KH13 account because 50 character limits are the best thing that ever happened to the game and I didn’t know quite how to PM in-game. Your guides were awesome for me to help me hone and strengthen my understanding of the game. It’s a shame you didn’t choose me to be your guilt target though Thanks for helping me through that beginner’s stage and explaining the stuff I didn’t know and what google translate wasn’t translating haha. - Sky and soravids – Thanks to you lovely people on the KH Chi team for not only providing weekly updates (back when we had weekly updates!) but also for providing commentary on the events and, to especially Sky, for our conversations together in the “Show off Your Accomplishments” thread. Definitely would not have tried to up my game and actually become a part of KH13’s Chi team if you weren’t a member of this community. Best of luck to the both of you, wherever your travels make take you! - Badger – Thanks for finding me a party to stick with for a little bit. You were my first friend, officially, in Chi, so even though we may be far apart, our hearts are always connected… or something like that . Thanks to you and your team, I was able to propel into my current team for more than a year. Hope life is treating you well and may you enjoy the pleasures of UX in all of its glorious English-ness. - CutiePique PT – Wow, more than a year has passed since I joined your party. How time flies! This would be the place where I would say something of the effect “To many more!” but obviously with Chi’s shutdown, that can’t happen. Yes, UX is here and we’re all happy playing it, but Chi is the place where we all met, played, got frustrated, lost, won, Guilt Helped, strategized, BP supported, lagged, RD’ed, language exchanged, laughed, and ranked together. Honestly, I wouldn’t, couldn’t, have chosen a better team to do it on. Thanks for the memories everyone Even if we do go our separate ways, if we follow the hearts, then we’ll find the way (that’s something Master Aqua told me once). Whether we meet again in UX or not is beyond the point for right now; let’s do our best in these last few months! Feel free to respond to share your comments as Chi terminates – your favorite moments of this last year, your thoughts for the future, anything and everything. This is a place you can think about what this year has been for you and how, perhaps, Chi has changed you throughout the years. If you like, feel free to share your screenshots of the game and maybe type a comment or two about your thoughts on it. While being respectful of the feelings that each of us have for the game, let’s remember Chi and let’s go out with a bang! Chi’s making it easy to give your alt some TLC (the tender-loving-care TLC, not the network). As covered here, Chi has made it easy for you to make you – and your alt – A-team material. How, you may ask? It’s actually quite simple. By distributing more and more SR+ cards, both Assist and Attack, including some nice Key Arts in the Raise Draw, you don’t need to go chasing down what cards you want in your deck. Especially for an alt, you’ve probably participated in events on both of your accounts. This means that you probably already have a full SR+ deck, or something very close to it. But a SR+ deck does not an A-team member make. You have your nice and shiny cards, but there’s one thing keeping you back on your alt from joining your main. We’re talking about Ultimization, keyblade level, and/or skill equips. Chances are you have very few to no cards that have MAX stats, a keyblade in the mid-thirties, and a few skills. And that’s OK. It’s an alt, after all. But if you want to make your alt the very best it can be, now is the best time to do so! Additionally, now is the best time to start an alt (or perhaps you want to start playing Chi now?) if you were ever considering making one! If you’re a long-time player of Chi, you’ll know in a few months we’ll have our 3rd anniversary. You’ve probably already been stockpiling potions for the last few weeks and reducing your ether consumption slowly on your main. But it’s actually quite easy to get the materials to make a MAX deck specific to the 3rd anniversary, regardless of if it's on your alt or main (or both!). As shown in past events, generally one type of card – either assist or attack – will influence the drop rate of the event items, which in turn you can exchange for a lot of goodies. With this method, you can prepare as much/as little as you need. However, the key lies in preparing ahead of the event, so the sooner you can start this, the more prepared you can be. What you’ll need to do is stockpile. The amount of cards, Yen Sids especially, will depend on how you prepare. You will need, for a fully MAXed deck: - 84 Yen Sids for the cards themselves (This includes both attack (54 YS) and assist (30) cards) - 270 Yen Sids for the Attack Cards - 210 Yen Sids for the Assist Cards (This totals to 564 Sids!) - 45 Attack Moogles - 35 Assist Moogles (see below for an exact number that you will need based off your card’s stats) - 80 FGM SR+ (45 for the Attack Moogles, 35 for the Assist Moogles) - 135 Random SR+ Attack cards (can be HPed or not, doesn’t matter as they’re ULT fodder) - 75 Random SR+ Assist cards (can be HPed or not, doesn’t matter as they’re ULT fodder) These numbers are the maximum that you will need. Your cards may or may not take this many Moogles or Yen Sids. Most likely, they will take less (Realistically, it should take 45 Attack Moogles, 30 Assist Moogles, and 66 FGM SR+ - you won’t need to boost all of the Attack Moogles). So, let’s take a look at how many Moogles you’ll need. Please note that the numbers that you will be comparing to need to be in the third ultimization cycle (the one with the 12). Attack: For most every card, you will need 4 SR+ Attack Moogles with a 3x boost plus one extra, which may or may not need to be boosted (if it needs to be boosted, only boost it by 2). You can determine if the final card needs to be boosted or not if, before confirming the ultimization, the stats read (or do not read) MAX on the right-hand side of the window. If the stats do not read as MAXed, then use a SR FGM to boost your card, which should bring your card to that MAX reading and give it MAX stats. Cards such as the Key Arts and the Kingdom/Premium box cards, depending on their stats, do not need the extra card; you will need to only use 4 (or depending on what cards you use in the first two stages, potentially 3) SR+ Attack Moogles boosted by 3. For Assist cards, generally you will be working off the LUX stat to determine how many cards you will need to use for MAX stats, as the HP stat caps out quicker than the LUX stat. However, if you only want max HP and not LUX (or only have enough Moogles to go for max HP), your Moogle usage will be lessened by about half, depending on your card’s stats and the like. Assist: Generally, most cards will require only 3 Moogles with a 3x boost to achieve MAX HP and 6 Moogles with a 3x boost to achieve MAX LUX (in addition to HP). Those with higher stats will take less. The question is, now, how on earth do I collect that many Sids? 564 is a lot, no duh, but that’s why we’re starting early. Each time the Mog trade-in is refreshed (about once a month), you’ll be able to buy 99 Yen Sids for 4950 Mog Coins (the cost of about two costumes or ten adamants). The event shops also sell Sids for about the same price, which means your last grouping for Limit Cutting the event cards can be bought during the event. Additionally, through the missions, you’ll be able to get Sids and excess Moogles. Because you only need 45 Attack and 35 Assist Moogles, at maximum, you’ll be left with some that you can use to Limit Cut, which really helps to reduce the cost. Now that you have your deck in progress, you want to work on leveling up that Keyblade of yours, right? While we don’t know what kind of keyblade will be emphasized for 3rd anniversary, you can plan ahead and prepare for it. The first step is the easiest to take, especially right now. Currently, we are in a period of a +1 item pick-up campaign. What this means is that any item you examine, in-game, you will get at least 2 and up to 4 of that item, and the respawn time of the item is reduced to 30 minutes. This means that acquiring the items necessary for leveling up your keyblade, at least to about level 40, should be easy. Remember that you can now buy Orichalcum x5 in the Mog Trade-In for only 50 Mog Coins. Getting to level 40, even on your non-main Keyblade, should be relatively painless. For the keyblade Moogle of Glory, you can buy the items needed to level it up in both the event shops and the Mog Trade-In. After that, what you can do next is up to you: - You can either, slowly, work on leveling up one Keyblade to its MAX level (currently level 50). This is a large timesink, as this method requires the new item “Electron,” which can be obtained in difficult missions which your alt may not be equipped to do. However, this insures that you have a powerful keyblade at your disposal to help clear difficult content. - You can work on leveling up each keyblade at the same pace (ie, have them all at 41, then level them up to 42). This insures that you have a wide variety of keyblades to do whatever is necessary but you might not have the multipliers to defeat difficult enemies or cards that suit each keyblade. However, until about level 44, the cost is relatively cheap overall, and you’re constantly traveling to different worlds and not worrying about respawns on items. - You can collect items to level up your keyblade but not actually level it up until 3rd anniversary, when we see what the main keyblade will be. This is probably the safest one to go with, but it leaves your keyblades underleveled until 3rd anniversary, making it difficult to clear current content. Additionally, your current cards might not align with the keyblade chosen for 3rd anniversary, so you may find yourself lacking at the beginning of 3rd anniversary until you can finish ULTing your cards. - Finally, if the 3rd anniversary introduces a new keyblade to the mix (much like 2nd anniversary introduced the Moogle of Glory), you may want to consider saving some Adamants/Electrons or not leveling up your keyblade (if you happen to be close to a level-up) until the event starts. Finally comes the finicky business of skills. Most top Chi players understand that their power comes from their skills, not from their ULTed cards or their awesome keyblade multipliers. The issue, though, is obtaining those skills that you will use for your cards that you may or may not have. If you have an older alt, you may have a few skills from rankings or mission clears. However, these skills pale in comparison to your main. Compared to my main, my alt only has two pages of skills, whereas my main has six full pages of skills, not including the skills attached to my ~20 ULTed cards. The place that I would start is the event trade-in and (if there is no event shop) the Mog Trade-In. Generally, you will be able to find III and IV skills (for stuff like HP and Attack) for pretty cheap; however, they generally will only be time-limited: that is, you can only buy two or three a day. If you can, log in (for daily rewards as well!) and buy those skills. It shouldn’t take that long, especially if you already have the drops. Start with the important skills – Attack UPs/Berserks, Combos (a bit more expensive, but the I is still relatively cheap), Counters, Cures, Last Revives (get the II if you can – one II is better than 20 Is), and HP UPs. While they might not be the Berserk IV/Combo II/Cure II/Counter III that your main has on all of its attack cards, it’s indeed a start to which you can improve. If you feel so inclined, some of the cards in the Raise Draw, Kupo Nut Draw, and the Mog Card Draw either have fixed skills or come with a random skill. It’s good to glean the removable skills of these cards, especially because now removing a skill only costs 1 munny. For the fixed skills, such as Combo EX, that’s just one slot that you don’t need to focus on filling. Obviously, if you're using this to prepare for 3rd anniversary on your main, you can transfer your skills from your main deck to your 3rd anniversary-specific deck. Best of luck on raising your alt and best of luck preparing, to all, for 3rd Anniversary! Kingdom Hearts χ - "Card Warehouse"
Kingdom Hearts χ - "Dark Corridor"
Hey Kingdom Hearts χ[Chi] players! As of the 2/4 maintenance, we have a new feature called the "Dark Corridor." Sounds scary, right? It can be quite intimidating at first, but once you understand how it works, it'll be a whole lot more fun! Warning: this post will have a lot of pictures in spoilers, so don't try to load all the pictures at once, okay? To access the Dark Corridor, merely click the image in the bottom-right hand corner of your home screen You'll then be taken to the "Dark Corridor" home screen. It's very important so we'll go through it together, piece by piece. (picture taken from here) 1) is your target boss to defeat. As you can see, the more beads of light (the little blue balls) you have, the tougher the enemy. 2) is your clear reward. If you clear the mission, you'll get those as bonuses. 3) is your high score. 4) is your Activity Count (ActCount for short). This acts as AP in the Dark Corridor. You are limited to that many actions in the Dark Corridor before retiring or refilling your ActCount. 5) is your Light Bangle. You need to have at least one of these in your inventory to go into the Dark Corridor. It will be consumed once you enter. How do you get the Light Bangles? Well, they're rewards from different missions, and additionally they are available as log-in bonuses! So make sure to play a lot and beat a bunch of heartless outside of the Dark Corridor as well. Please note that you cannot change your deck after entering the Dark Corridor, so make sure you have the deck you want before entering! When you're ready to enter, click the big red button and a new screen will pop up! When you start getting TP, you can click one or more of the options to either increase your damage output or your defensive stats. Click on the big red button to head into the Dark Corridor! There are a few different things you can do in the Dark Corridor. You can pick up treasure chests and beat heartless. The type of heartless you choose to beat will give off different amounts of the beads: the weaker heartless will give off less, the more difficult will give off more. When you target an item (hover over the item), you can see the minimum amount of beads it will give off when defeated. You'll be rewarded for quick subjugations for the heartless that have a high level (Darkball, Invisible, Wyvern, Large Bone, others possibly). The bead value for treasure chests is static. In order to progress to new areas, you'll need to have a certain amount of beads. The amount of beads needed is proportional to the difficulty of the area: weaker areas cost less, stronger areas cost more. The ultimate goal is to get to the boss at the end of the stage. As stated prior, the boss will differ bassed on the amount of beads you have. Beating the boss (what SE calls a target) will trigger a "Trial Clear" with rewards. Make sure to finish all your business in the world before beating your target! For paying players, there's an item in the shop called the "Light Cape" which will restore your ActCount if you get down to 0 before defeating the boss. It acts much like a mega potion in this regard. Note that you can only use the Light Cape when you run out of ActCount, and no time before. One last thing, as you make your way through the Dark Corridor and back out into the daylight, there's a "High Score Reward" that if you keep increasing your high score, you'll get better and better rewards. Routes: For beginning and intermediate players: https://www.youtube.com/watch?v=4WZ9bVbqJ9Q And for the advanced players: https://www.youtube.com/watch?v=p_Lwvlad-a8 Please remember that these routes are only mere suggestions. Good luck in your expeditions! Feel free to comment if you have questions or suggestions to help our understanding of this new feature! Why Kairi Can't Be Vulpeus. First I'd like to say that I'm a subscriber to the reincarnation theory. But I feel there's is a hole in this theory that goes largely ignored. Kairi. Here I'm going to detail the problem and see of we can't find a way the theory works. As stated in 3D, when the χ-blade shattered, the 7 fragments of light eventually became the hearts of the Princesses of Heart. Kairi, is one of these Princesses. This means that, before the Keyblade War, her heart was part of the χ-blade. Therefore Kairi could not have existed as an individual prior to the χ-blade shattering. If she did not exist as a person before the Keyblade war, she can not be the reincarnated Ava. So, does anyone have a way Nomura could work around this? It's possible I suppose for Kairi's Grandmother to have been Ava in a past life, but not Kairi herself. 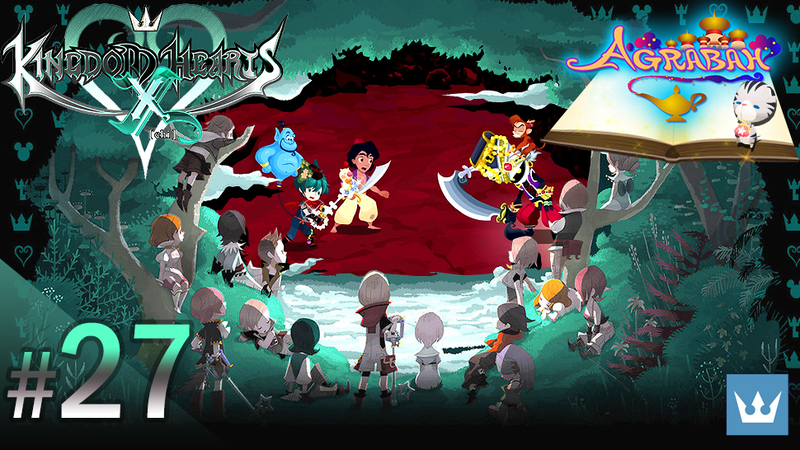 Hello good friends and bitter rivals in the rankings pool, we have yet another event going on in the worlds of Kingdom Hearts χ, and since it happens to be October, χ is doing, once again, another Halloween event. You'll notice this as soon as you enter Daybreak Town, with the main screen going pretty festive. However, there is still an event going on! Your goal, intrepid Keyblade wielders, is to collect sweets. This competition lasts from today (the first of October) to the 15th of October. Rewards, including event avatars, will be given out to those who rank in the top 5000. The rewards you get are determined by your placement in each of the categories. Different enemies drop different sweets, so if you want all the cool avatar parts, you'll need to beat four different enemies. More about that in the section to come. Lucky for you, for the two weeks that this event will take place, each week the rewards will be different, so if you happen to not play at all week one, you have an opportunity to still do well in week two. Reward highlights include: Combo Plus II, Last Revive II, and Berserk IV. To receive a costume, you must be ranked in the top 3000. How do you go about maximizing your spoils and minimizing your potion loss? Well, first you should consult the rewards list. Find an item or two that you really want. Secondly, you need to figure out what ranking you need to get that item. Generally, the fantastic rewards are in the top 100 spots, so you'll be challenged to get those rewards, needless to say. Then see what type of sweet you need to collect: Pumpkin Doughnut, Lollipop, Chocolate Bat, or Haunted Cookie. Each of those cookies correlates to a diiferent Heartless. Doughnuts are dropped by the level 33 Jack O Lanterns Lollipops are dropped by the level 555 Pumpkin Soldiers Bats are dropped by the subspecies Raid Boss "Hocus Pocus" Cookies are dropped by the level 666 Swinging Spook. In order to get a lot of points to place well, you should consider increasing their drop rate. This can be done with certain Assist cards, like Jack, Sally, or Dr. Finklestein. The SR give off less of a boost than their SR+ counterparts, so if you want the ultimate collecting assist deck, they should all be SR+ HP'ed cards. You may have trouble hitting or defeating these event heartless, especially the level 555 or the 666. You can boost your damage to them by using the new boosted cards available in the Kingdom Box for October, from mission rewards, or from the boosted Raise Draw cards. While they do not provide a boost to your drop rate, they do provide an easier time defeating these enemies. Now, all that you need to do after this is beat the heartless! Consider helping your teammates in Guilt help if they haven't finished off the heartless you're going after, since it will benefit both of you as players. If you want high rewards, feel free to use your potions - that's what they're needed for, anyway - but know if it's taking you 80 potions to defeat one enemy, it may not be in your best interests to continue in that path. Weigh your options carefully. So what are you aiming for? Let us know what your goals and aspirations are for this event below. Best of luck and happy sweets hunting, everyone!! I was gonna fight a LVL 666 Roudy Master (Big guy), almost killed it. But then the internet connection is frozen and cannot be fixed without restarting computer. I came back to game and everything's reset as before. Can I report about this bug? Can I get my potion back? Please help! Yeah this sounds stupid to do by the way. I feel bad about this.